So how would it work? The scientists have created a type of plasma which, when compressed within a magnetic field, can produce a powerful fusion reaction. The team has demonstrated this process in the lab, and a small “grain of sand” of the material can generate as much energy as a one gallon of rocket fuel. 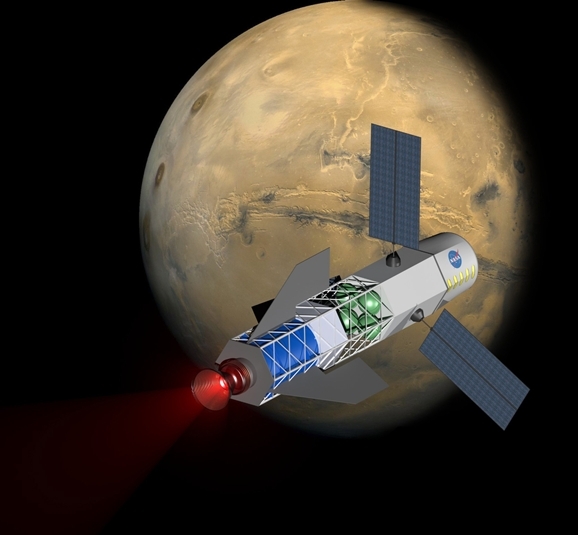 In their design, the powerful magnetic field collapses metal rings around the plasma, sparking a fusion reaction and creating an ionized ”shell,” which is then ejected out the back of the craft, propelling the ship. You can see a couple of videos demonstrating this process below. The researchers have published papers breaking down the specifics of possible 30- or 90-day trips to Mars using the process. Having demonstrated successful tests of the various portions of their concept, they now have to demonstrate that it all works when strung together as a whole. After demonstrating their success so far, they recently received a second round of funding from NASA’s Innovative Advanced Concepts Program. If it all works as they claim, this could be the thing that finally makes further space travel more feasible and affordable. Fingers crossed!